What Causes Heart Disease - The Number 1 Diagnosis in Home Health Care? the number one diagnosis in home health care. What causes heart disease? It must be something common to make it the number one treated diagnosis in home health care for men and women. The Centers For Disease Control site (through their sources) that 11% or about 150,000 patients are receiving home health care with a diagnosis of heart disease. What are your chances? Coronary artery disease specifies disease of the arteries supplying the heart. In my years of home health care, this has been the most prevalent of conditions that I have treated and one of the most debilitating as well. The heart is to the body as the gas tank is to your car. If you can not get gas to your car, your car does not run. If your heart pump is weak, you lack blood supply and oxygen to the muscles in your body needing supplied to work. As a physical therapist, I have always focused on changing inactivity to activity. The heart, a muscle, needs exercise. If your doctor has asked me to come and see you for PT, you can bet that we'll be moving! Outside of home care, close to one million people die of diseases related to the heart and blood vessels every year. This number is sadly growing. This means that about every 33 seconds, one American dies of cardiovascular disease. About 2600 deaths every day! That is more than 10 jumbo jet crashes per day with no mention of these daily deaths in the news. Heart disease usually develops silently as shown below. 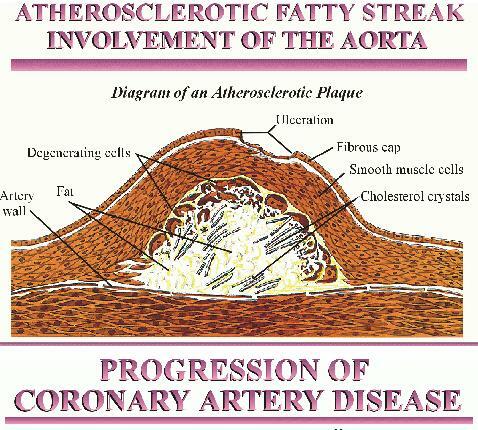 Starting as fatty streaks, then atherosclerosis as plaque ( a fibrous cap) is formed to prevent a deadly blood clot. This, in fact describes "Athero" - a mushy or gruel-like fatty material build up and "sclerosis" referring to the hard fibrous material made by the body in response. At times, this cap can ulcerate when a piece breaks off. The new ulceration as well as the ulcerated piece can set in motion the activation of platelets, the body's clotting cells. The already narrow artery can become entirely obstructed. When this happens, the hear (or brain tissue) was dependent on that blood begins to die - or a heart attack. Symptoms vary and can even go unnoticed and causes of these symptoms can start as early as 20 years of age. 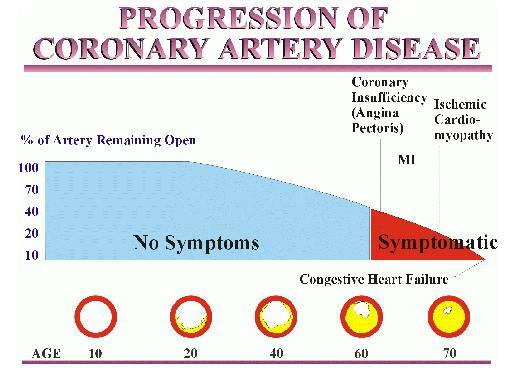 The progression of heart disease may not become symptomatic until as late as 60 years of age as indicated below. Heart disease can cause serious debilitating conditions. Home health physical therapy can help those with heart disease to gain strength and mobility after coming home from the hospital, nursing home or physicians office. Unfortunately, physical therapy can only practice within a narrow, yet vitaly important scope. We can not advise you regarding other lifestyle factors simply because we are not licensed to. However, knowledge is health - learn what causes heart disease so you can avoid those things and replace them with life! Stop Smoking 50%-75% in the first 5 years! Heart attacks can happen to anyone but your chances and therefore your fear of this (even if your family history is riddled with heart disease) can be greatly reduced by following all five of the recommendations listed above. These are factors that you can control. Factors you can't include race, gender and age. I would rather have you avoid a heart attack and learn what causes heart disease, and begin to reverse any heart disease you may have. You can take simple steps listed in the 22 alternative healing principles. Treat what causes heart disease now! Pictures taken from Proof Positive by Neil Nedley, M.D.